More than just a camera, the C300* and C300 PL* cameras mark the beginning of a whole new system for the motion picture industry. Form factor, ergonomics, image processing and lenses – re-imagined to tailor the experience of shooting to the needs of professional cinematography crews. Taking into account various shooting scenarios, the EOS C300* can accommodate situations where every last inch of maneuverability counts. With day-long shooting comfort and usability in mind, different components can be added or removed as needed. It’s also compatible with industry standard, third-party accessories so it can be easily rigged for studio, Steadicam, jib or just about any other configuration imaginable. Cooling system of heat sinks and fans protects sensor and allows for extended shootingSeamless integration with NLEs is just the beginning of effective post-processing. Clean image quality. Low S/N ratio. Canon Log Gamma for expanded dynamic range. File formats that hold up when multiple effects and color corrections are applied. Robust enough for the big screen, but convenient enough for on-set review and tweaking. XLRAvailable in either EF- or PL-mount configurations, Canon’s entry into the digital cinematography market allows the user to choose the right camera for their lenses and production needs. The EOS C300* has a Canon EF lens mount and is compatible with all of Canon’s EF lenses, including compact primes, super telephotos, specialty Tilt-Shift, Macro, fisheye zooms – over 60 in all. It also has communication contacts built into its mount, allowing functions such as focus and iris to be adjusted via the camera controls, or even wirelessly via the optional Canon Wireless File Transmitter WFT-E6A unit. This offers huge potential for specialty applications where cameras must be controlled remotely such as nature documentaries or reality TV. 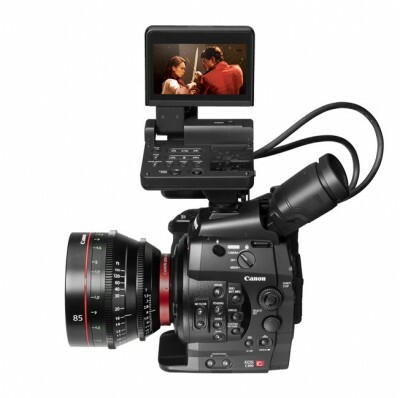 The EOS C300 PL* has a PL mount and is compatible both with a new series of Canon Cine PL lenses as well as the majority of third-party optics available for 35mm motion picture cameras. Not only is the EOS C300* versatile and compact, it’s ready to go right out of the box. Attach your choice of lens and start telling your story. The removable handgrip rotates as needed. It also has start/stop, iris control, and multi-controller functions. Also included is a 4-inch, 1.23 MP LCD Monitor/Control panel that rotates and accepts microphone XLR connections. An onboard waveform monitor and vectorscope eliminates the need for external exposure and color analyzers. Includes: EOS C300* body, monitor unit, viewfinder, eye cup, handle, thumb rest, XF Utilities, shoulder strap, WFT attachment, tripod base, battery pack, battery charger, AC cable, power adapter, DC cable.